When I heard an Indigenous style guide was being published this year, I was excited by the opportunity to learn a framework for approaching the works of Indigenous authors. I am a non-Indigenous editor — a settler — and in recent years I have become very aware of my long-standing ignorance regarding the perspectives of Indigenous Peoples. I hoped this book would help me to start building an understanding. 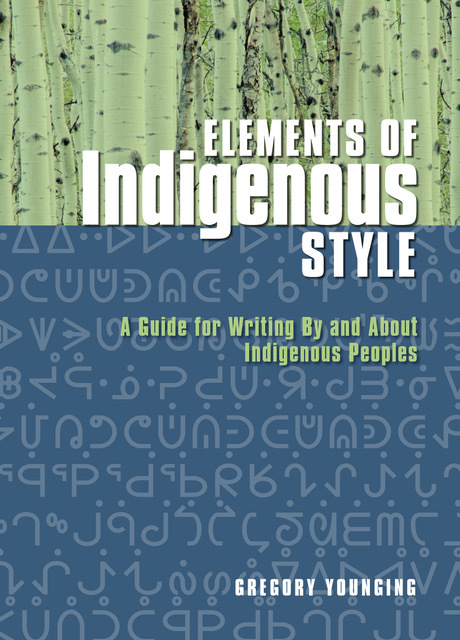 Elements of Indigenous Style lays out 22 Indigenous style principles, providing detailed explanations and examples while positioning everything within both a historical and contemporary cultural context. These principles are clear and useful for writers, editors and publishers, as well as enlightening for readers. Some of these principles cover wider concerns in publishing, such as the portrayal of Indigenous Peoples in texts, their cultural rights with respect to the publishing of Traditional Knowledge (certain stories, for example, are only told in specific seasons), and the importance of following Indigenous Protocols in a collaborative and respectful way. Other principles focus on the details of editing texts, such as using appropriate terminology (writing “Indigenous Title” versus “land claim,” for example), identifying and correcting biased language, capitalizing certain terms that would be lower-cased according to other style guides, and avoiding the past tense when referring to Indigenous cultural objects (which should not be referred to as “artifacts” — something I instinctively wrote here in my first draft, and then corrected, thanks to this guide). Along the way, Younging emphasizes the point that Indigenous Peoples are not a monolithic group that can all be treated or described the same way — each individual, within the context of their own community (and there are many Indigenous Nations), has their own views, including their own preferences on the spelling of names. Ultimately, Indigenous style as described in this guide is something that will continue to be built through thoughtful and ongoing discussion. This work serves as a wonderful foundation for that discussion, and I highly recommend it to all of my fellow editors. Previous post from Sue Archer: Confessions of a Conference Buddy (Coordinator). 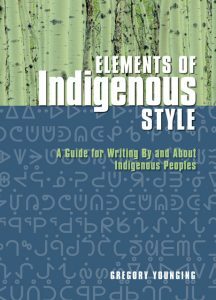 3 Responses to "Review: Elements of Indigenous Style: A Guide for Writing By and About Indigenous Peoples by Gregory Younging"
Long due guide. Wish we had something similar in French. I haven’t found any yet. If someone does, please let me know. I am so looking forward to reading this. I bought a copy at the conference this past weekend (how exciting to buy it from Greg Younging himself!). Thanks for this review. It will be useful when telling people about why the book is important.